If you’ve ever been a teenager, chances are you know exactly what kind of trouble kids get into when their parents aren’t around. They break rules, they experiment. But as mothers and fathers, we can’t just pretend that it isn’t happening right under our noses. As a mother with a 16-year-old boy myself, I know it’s my job to create a safe environment for him to grow, which is why if my son and his friends are going to deface a Jewish cemetery, I’d rather they do so safely in my home. 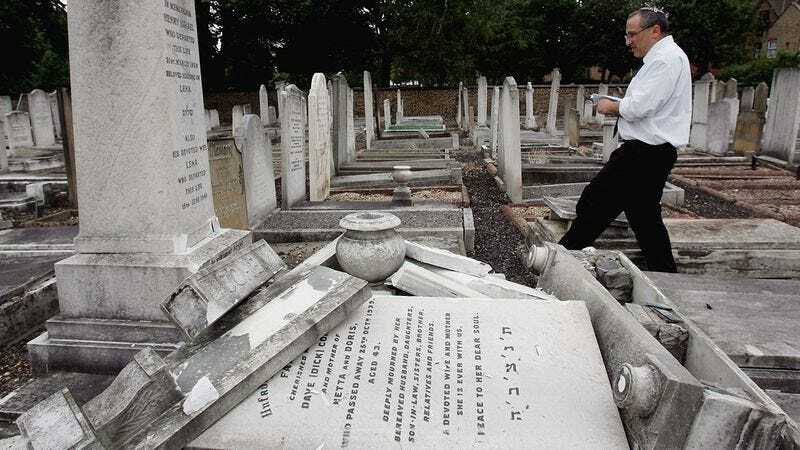 To some parents, this argument might at first seem reckless and irresponsible, but the reality is, my son is much more likely to stay safe destroying Jewish gravestones that are set up behind our house than he would in a cemetery. Every day, it seems like there’s another report of people desecrating a Jewish cemetery on the news, and I don’t want Andrew to go down that dangerous path when he could just as easily go in the backyard and topple a few Jewish tombstones in a controlled setting. It allows him and his friends to express their anti-Semitism without having to worry about screwing up their futures by getting caught and arrested by the police, and that’s a win-win. Bottom line, if Andrew and his friends choose to disparage Jewish graves in my home, they know they have to follow my rules. If I tell Andrew that he is forbidden from ever toppling a single Jewish tombstone, it’s only going to push him to go seek out the largest historically Jewish graveyard in the area to deface it. Do I want my son to go into the city with his friends and defile hundreds of graves behind some random synagogue with no adult supervision? No way. At least when he’s on my property, I know exactly where he is and which headstones of deceased Jewish people he is kicking over. And if my kid needs me, I’m just 20 feet away. Agree or disagree, I feel a real peace of mind knowing that my son and his friends are dishonoring the memories of Jewish people and sending a strong message of hate and intolerance under the surveillance of my watchful eye. Bottom line, if Andrew and his friends choose to disparage Jewish graves in my home, they know they have to follow my rules. Whether they are scrawling anti-Semitic messages on a deceased grandfather’s resting place or smashing a 300-year-old Star of David behind my tool shed with a baseball bat, they know they better be smart about it. Unfortunately, while there’s no rule book for raising a teenage boy, I’d much rather know that he and his friends are committing anti-Jewish hate crimes in my backyard, instead of turning on the TV one day and hearing about it on the news. It’s hard sometimes, but all I can do is raise them right, and the rest is up to them.